The folks at SEMRush hosted The Conversion Scientist for an entertaining hour on how to design search landing pages. It was fun and educational, and if you missed it you can see the entire thing right here. Hosted by SEMRush’s David Black, we covered the key components of a landing page that supports search traffic. Keep the promise made in the search ad. Thus, a search landing page must be tailored for the ad that is driving the traffic. If you don’t know the promise that is driving traffic to the page you are creating, then you are not building a landing page. You’re building something else. If your page needs anything other than content to make a visitor want to make a choice and take action, you’re probably not building a landing page. Each landing page needs all of five components. Keeps the promise and gives the visitor a reason to act. Provides a way for the visitor to take action, in their interest and in yours. A catalyst that helps the visitor feel comfortable and confident taking action. Another catalyst that supports the offer and the entire value proposition. Helps the visitor imagine themselves taking action on the site by “seening” the product. When you combine all of these elements together, you get a high-converting search landing page that is ready to be testing to improve performance even more. 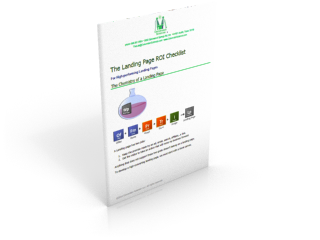 Twelve page checklist based on Brian Massey’s Chemistry of High-Converting Landing Pages Webinar. Makes the creation of landing pages fast and easy. Offers proven and tested ways to make your landing pages work.